Growing up, I was never a big fan of mincemeat, primarily because I didn't know what it was. MInce or mincemeat used in pies was originally a combination of meat, suet, and different fruits and spices and was always popular during the holidays. Today, mincemeat pies are primarily a combination of fruits and spices, with meat no longer being in the mix. So, this week, my facebook friend, Ida Waterous, sent me a recipe that she had already modified a bit, including the addition of Apple Pie Moonshine. I've tweaked Ida's recipe a bit more and think this team effort with her will make a nice addition to your holiday recipe collection. 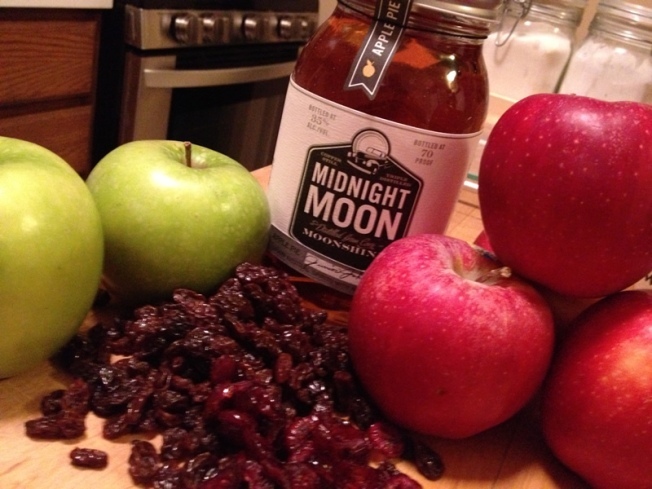 If you don't want to use alcohol in this recipe, simply substitute apple cider. Wayne shows you an alternative to the traditional mincemeat pie. Cut butter into small cubes. Cut or pull cream cheese into small pieces. Combine all three ingredients. Using your fingers, mix to form a dough (you can also put ingredients in a large food processor and process until dough forms a ball). Knead for about 30 seconds. Split dough into two equal parts and wrap in plastic wrap and refrigerate for an hour. 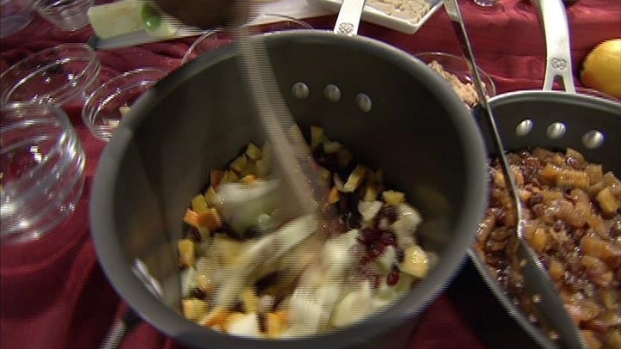 Combine raisins, cranberries, apples, orange, lemon and apple cider vinegar in a medium saucepan over high heat. Bring mixture to a boil, then reduce heat and simmer for 10 minutes. Add remaining ingredients and simmer for 20 minutes. Remove from heat and allow mixture to cool and thicken. If you have time to let the ingredients rest overnight, the flavor and consistency will be better. Roll out one crust large enough to line your pie pan and allow edges to lay over the sides by at least 1/2". Using a slotted spoon, transfer the filing into the crust leaving behind any excess liquid. Reserve the liquid. Spread the ingredients evenly in the pa. Place the top crust over the pie and crimp the edges together. Cut steam vents in the top. If you have extra crust, roll it out and cut additional shapes, like leaves, and decorate the top of the crust. Brush egg over the surface of the top crust. Place pie on a baking sheet and bake for 40 minutes or until crust is golden brown. Cool to room temperature. Serve with a bit of the reserved liquid, either a room temperature or heated a bit. Thanks again to Ida for sharing this recipe. If you have any comments or questions, please send me an email at wayne@waynesweekend.com or follow me on Facebook or Twitter.